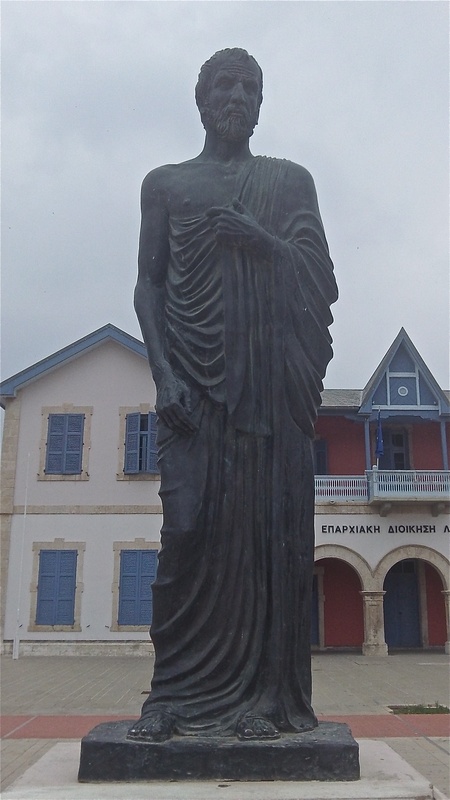 A May 16, 2012 photo of the Zeno of Citium statue in Larnaka, Cyprus. Zeno is situated so he’s looking out at the Mediterranean Sea, and on this particular day he was staring at a fleet of fishing and recreational boats in the harbor. Although I’m not too sure about the cosmos, this particular passage was of interest because it smacks of individual human perception. If a person is feeling not-so-good, then there is a chance they’ll see not-so-good in their surroundings and in the natural world. This passage and these readings on Zeno are also reflections of the way historians and philosophers have thought about his ideas through time: there was Zeno, and then there is everything that has been said after Zeno about Zeno. Then there are public history displays established on Mediterranean islands that memorialize Zeno. If the public pays attention to these displays, the interpretation brings about a type of common understanding of Zeno (sometimes known as collective intelligence; or to a degree what William McNeill called mythistory). Anyhow, these are just a couple thoughts that roll through a guy’s mind when he’s reading articles on Zeno and then running into beach-front Zeno memorials on Cyprus, this just west of the Levant. This entry was posted on Wednesday, May 16th, 2012 at 11:24 pm	and posted in Uncategorized. You can follow any responses to this entry through the RSS 2.0 feed.